Chris here! You might know that even though I'm by far my mom's most special and spoiled baby (don't tell anyone that!) and she's a true dog person, she loves all animals. She has 3 hermit crabs, 7 land snails and now a Betta fish! My mom got him at Petsmart on Tuesday. She had been researching Bettas for a long time and was waiting for the right time to get one. The right time came, and my mom was determined to have a Betta. Her parents knew she would pay for it and take care of it, but my mom still wrote an argumentative essay on why she should have a Betta fish. They said yes, and my mom adopted Scuba, a Twin Tail Halfmoon Betta, from Petsmart. 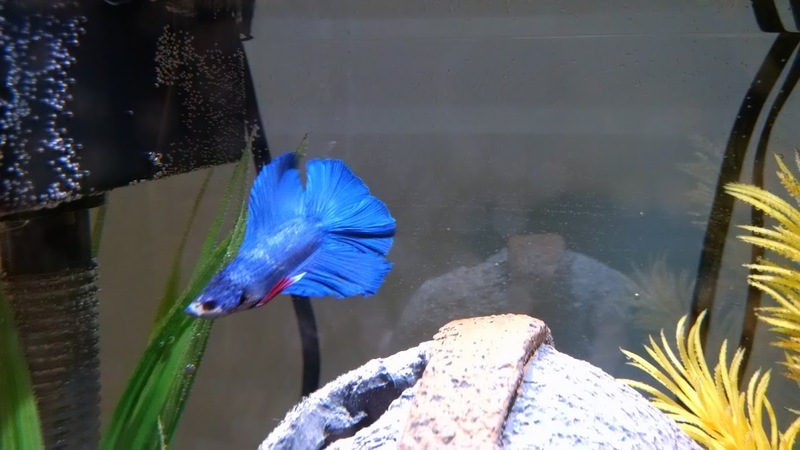 He's got a stunning, vibrant blue color with red on two of his fins and a faded red stripe on his sides. 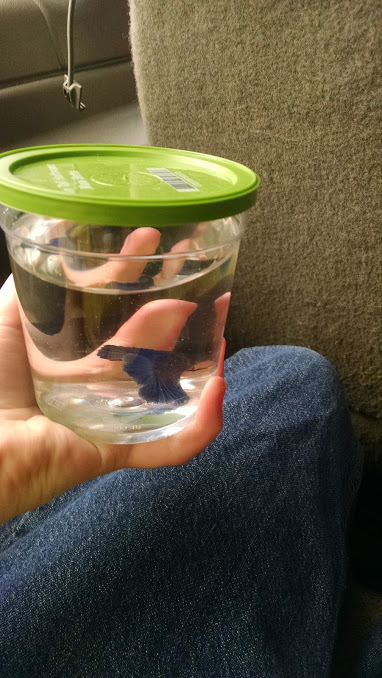 Because male Bettas like Scuba will fight to the death if put together, the Bettas at Petsmart are kept in small cups. It's pretty sad. It's also sad that most people buy the Bettas and keep them in fish bowls, feed them, and that's it. Bettas actually need to have an at least 2.5 gallon tank, conditioned water, a heater, a filter, and a constant temperature of 75-82 degrees. Bettas can live from 2-5 years if cared for properly. 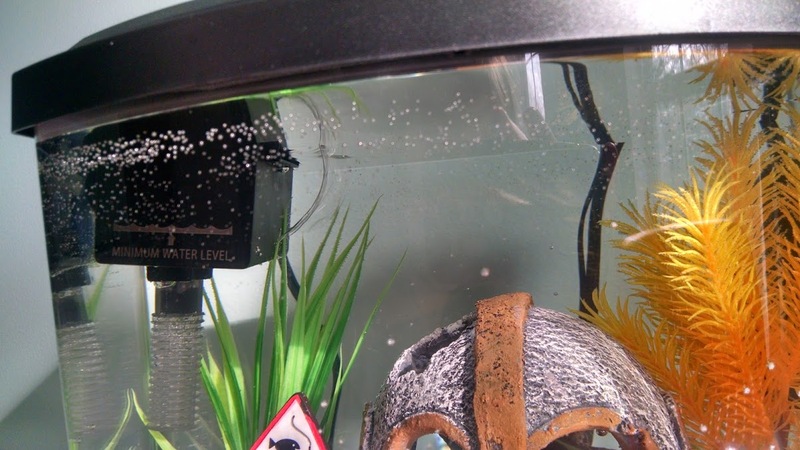 My mom set up Scuba's tank when she brought him home but couldn't acclimate him to the tank until the next morning because the tank was still cycling. To acclimate him, she let the cup he came in bob in the tank water for 15 minutes before releasing him into his new home. 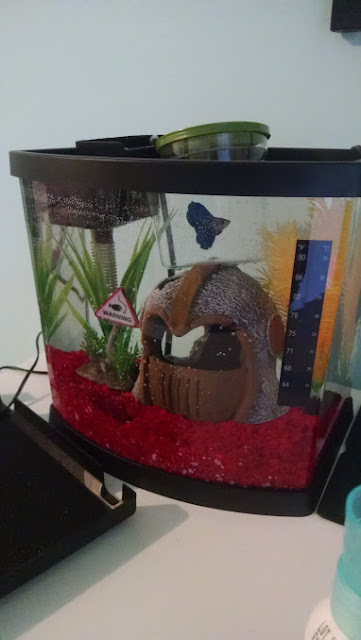 Scuba has a 2.5 gallon tank with a lid with LED lights attached to it, a filter, a heater, a thermometer, something to hide under, a couple plants, a sign in his tank for decoration, gravel at the bottom of the tank, conditioned water, and he eats the best brand of Betta food. You might think he's a super spoiled Betta, but all Bettas need care like such to thrive! 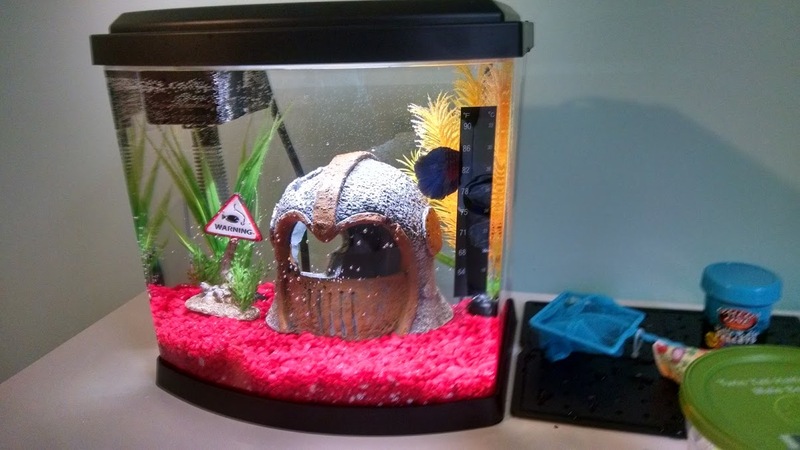 The first day Scuba was in his tank, he hid behind the filter all day. 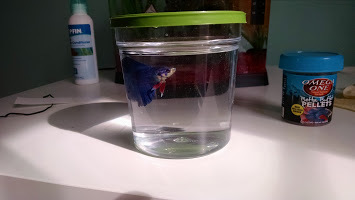 At first my mom thought he was just stressed, liked hiding there, or wasn't use to the vibration of the filter, but she realized he had trouble swimming anywhere in front of it because the current was so strong. She made a DIY filter baffle with an empty water bottle and Scuba was immediately exploring his tank without being pushed by the filter's current! You can't really see it, but here is the filter baffle on the filter. One reason my mom wanted a Betta is because they're very smart. They can be taught to do simple tasks and even some tricks! They can learn to bond with their caretakers and they enjoy when people are near their tank. My mom will start some basic interaction with Scuba for training on Saturday when he's all settled in. Don't worry, she won't touch him or his water! She wants to teach Scuba how to go through a hoop, follow her finger along the glass, come to her hand for food, and flare his fins on command. 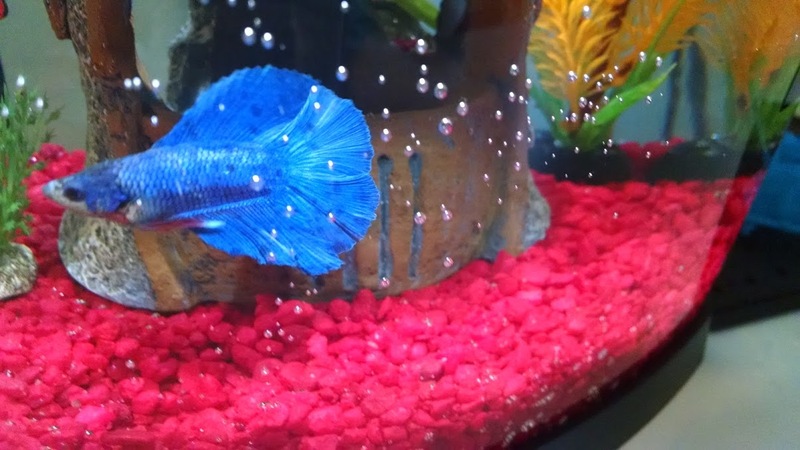 Many Bettas know those tricks! Anyway, my mom lined up 10 or so Bettas at Petsmart when she was choosing a Betta, and she had trouble choosing one because she was afraid that even though she liked them all, for some reason she wouldn't be content with the one she chose. She didn't really feel a connection with any of them, including Scuba, until he looked at her with adorable eyes and tapped against the side of his cup! How does my mom take care of Scuba? She feeds him 3 pellets in the morning and 3 pellets in the evening. Every 10 days, she'll do a 25% water change in Scuba's tank and use an aquarium vacuum to clean his gravel. Every couple of months, she'll do a full water change in his tank. Throughout the day she monitors the temperature in his tank and tries to spend a little time with him at her desk. Don't worry, he lives in his tank, the picture was below was taken while my mom first cycled the tank once she brought Scuba home! Scuba will only go in the cup when the water is being changed from now on. I made a deal with Scuba last night...unless I had something I really wanted to post on a Friday, I'll let him do Fishy Fridays on my blog from now on! I thought it would be a good way for you to get to know him. We'll see how it goes tomorrow! See you guys on Saturday! OMD, Fishy Fridays is grreat idea! I can't wait to get to know Scuba better. What a beautiful little guy!! Our pawrents love doing the SCUBA diving...so they just love his name! Hey Scuba! Something sounds fishy about this post. BOL! Sorry, had to say it! Scuba is such a pretty fish! Before my mom got me, she had a bunch of beta fish herself, including a small sororiety of female beta. They are very smart and so pretty...if my mom is to be believed! I'm sure you and Scuba are going to be the best of brothers, Chris! You have gorgeous Scales Color. BLUE is a REAL favorite around here. Suba is a very lucky fish to have such a caring home--one that has carefully researched his well-being. Welcome to Blogville, Scuba. SHE enjoys the bit of your mom having to write an essay! Nice to meet you, Sciba - you sure are a beautiful beta!!! What a beautiful fish! Wow!